A d.c. motor makes use of the turning effect of a current-carrying coil in a magnetic field to convert electrical energy into mechanical energy. Current flows from Q to Y, goes through the coil ABCD and out through X to P.
Using Fleming’s Left Hand Rule, a downward force acts on AB and an upward force on CD. The coil thus rotates clockwise about axle until it reaches the vertical position. 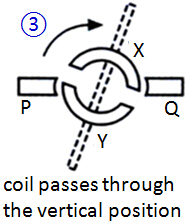 When coil is at vertical position, no current flows as neither X nor Y is in contact with P or Q. The momentum of the coil, however, carries it past the vertical position. The half ring Y now touches P and X touches Q. Current flows from Q to X, goes through the coil DCBA and out through Y to P. (﻿Current is reversed in the coil﻿). Use Fleming’s Left Hand Rule, a downward force acts on CD and an upward force on AB. The coil continues to rotate in clockwise direction. 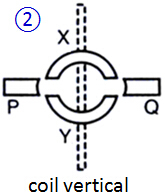 The diagram shows a simple d.c motor with a coil ABCD rotating between the poles of a strong permanent magnet. (a)(i) State the direction of the forces (upwards/downwards) acting on the side AB and CD, respectively. (ii) State the direction of the moment produced in (a)(i). (b)(i) The coil rotates through 180° so that AB is close to the S-pole. Explain why the coil continues to rotate uniformly. (ii) Explain why the carbon brushes cannot be touching both halves of the split ring commutator simultaneously. (c) Sketch a graph to suggest how the moment acting on the coil varies with time as the coil rotates at constant speed. Label each axis. On the time axis, mark clearly the time taken for one revolution of the coil. (a) (i) AB is upwards and CD is downwards. (b) (i) The presence of the split ring commutator reverses the current in the coil every half a revolution which reverse the direction of force acting on AB and CD. This ensures the coil to rotate in the same direction. (ii) Short circuit will occur. Note that the forces acting on AB or CD are always upwards or downwards. Recall moment is the produce of force and the perpendicular distance from pivot to the line of action of force. Therefore, when the coil is ﻿horizontal﻿, moment is maximum wile when the coil is at vertical position, moment is 0 as the perpendicular distance is 0. Since the coil always rotates in the same direction, the waveform is also in the same direction.